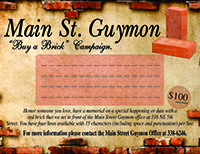 Main Street Guymon Mission Statement: Promoting the history, culture, and commerce of the downtown district. View our bylaws. Over the past 30 years, the Main Street movement has transformed the way communities think about the revitalization and management of their downtowns and neighborhood commercial districts. Cities and towns across the nation have come to see that a prosperous, sustainable community is only as healthy as its core. The Main Street Four-Point Approach® is a unique preservation-based economic development tool that enables communities to revitalize downtown and neighborhood business districts by leveraging local assets – from historic, cultural, and architectural resources to local enterprises and community pride. It is a comprehensive strategy that addresses the variety of issues and problems that challenge traditional commercial districts. The four points of the Main Street approach work together to build a sustainable and complete community revitalization effort. They are Organization, Promotion, Design, and Economic Reconstruction. Organization establishes consensus and cooperation by building partnerships among the various groups that have a stake in the commercial district. By getting everyone working toward the same goal, your Main Street program can provide effective, ongoing management and advocacy for our downtown district. Through volunteer recruitment and collaboration with partners representing a broad cross section of the community, your program can incorporate a wide range of perspectives into its efforts. A governing board of directors and standing committees make up the fundamental organizational structure of volunteer-driven revitalization programs. Volunteers are coordinated and supported by a paid program director. This structure not only divides the workload and clearly delineates responsibilities, but also builds consensus and cooperation among the various stakeholders. Promotion takes many forms, but the goal is to create a positive image that will rekindle community pride and improve consumer and investor confidence in our commercial district. Advertising, retail promotions, special events, and marketing campaigns help sell the image and promise of Main Street to the community and surrounding region. Promotions communicate our commercial district’s unique characteristics, business establishments, and activities to shoppers, investors, potential business and property owners, and visitors. Economic restructuring strengthens your community’s existing economic assets while diversifying its economic base. This is accomplished by retaining and expanding successful businesses to provide a balanced commercial mix, sharpening the competitiveness and merchandising skills of business owners, and attracting new businesses that the market can support. Converting unused or underused commercial space into economically productive property also helps boost the profitability of the district. The goal is to build a commercial district that responds to the needs of today’s consumers. The National Main Street Center’s experience in helping communities bring their commercial corridors back to life has shown time and time again that the Main Street Four-Point Approach succeeds. That success is guided by the following eight principles, which set the Main Street methodology apart from other redevelopment strategies. For a Main Street program to be successful, it must whole-heartedly embrace the following time-tested Eight Principles. Partnerships: Both the public and private sectors have a vital interest in the district and must work together to achieve common goals of Main Street’s revitalization. Each sector has a role to play and each must understand the other’s strengths and limitations in order to forge an effective partnership.